This past week saw me turn one more year older and I wanted to make something special to celebrate the occasion. I was pondering on what to make for a couple of weeks and inspiration finally came when I fully discovered my new favorite baking blog, Sweetapolita. If you haven’t been by Rosie’s blog yet, get there now! Prepare to be blown away – her baked creations are stunningly beautiful and positively drool-worthy! I had read a post or two at Sweetapolita before, but only recently did I fully realize just how many tasty and beautiful treats there are to be found. 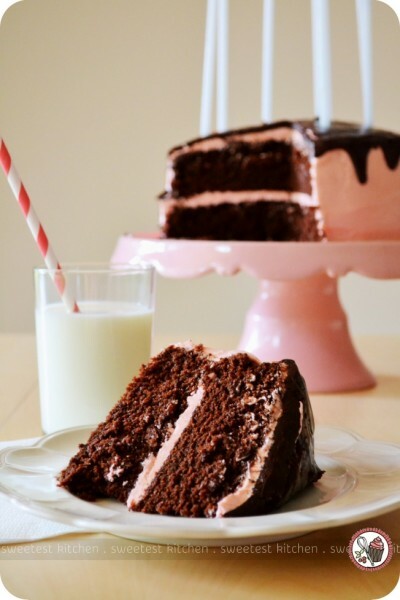 My inspiration came from Rosie’s six-layer dark chocolate and strawberry buttercream cake. This is a very simply-presented cake, but yet I just fell in love with it. This was my version of Rosie’s cake! It isn’t quite as lovely as Rosie’s, but I’m very proud of it and it tasted amazing! I made a few changes with the recipes. The two main differences are that my cake is just a 2-layer cake, and I didn’t use Swiss meringue buttercream. It’s not that I don’t know how to make Swiss meringue buttercream; it’s actually my favorite buttercream! But, during the move to our new house, I lost the whisk attachment to my dear KitchenAid mixer, Katie. You can’t make this kind of frosting without a whisk, so I had to use a regular buttercream frosting instead. Otherwise, I used Rosie’s dark chocolate cake recipe and her chocolate ganache glaze recipe. I prepared the cake in 2 8-inch baking pans the day before and placed the layers in cling wrap and into the freezer overnight. The next day, I prepared the frosting and took the layers out of the freezer – I had read previously that it’s easier to frost a frozen cake because crumbs won’t crumble off the cake and ruin the look of the frosting. I placed the bottom layer of cake upside-down on the cake plate, and the top layer of cake right-side-up, so there wasn’t even any cake-cutting involved. I thought about cutting off the top of the cake to make it flat on top, but decided to leave it as is. The frosting I used is a recipe off the back of a Western Star unsalted butter package. It claimed it was the “best” buttercream frosting, so I decided to give it a go (I had to double the recipe). You’ll need a stand mixer for this recipe because you’ll need to beat the frosting for a total of nearly 20 minutes! This gives it a really soft, fluffy texture. It was a warm day when I made the frosting, so my frosting was probably a little softer than it should have been! Rosie used a bench scraper to to give her Swiss meringue buttercream a perfectly smooth finish, but I don’t have one. I used my palette knife instead but couldn’t get the frosting to have that same look that Rosie’s cake did! Still, I like the rustic look of my frosting! I added “rose petal pink” gel food coloring and about 1/2 teaspoon of strawberry flavoring. The chocolate cake itself isn’t very sweet. Or at least, mine wasn’t. I was a little concerned that it wouldn’t be sweet enough! I used Van Houten cocoa powder, and I probably used coffee that was a bit too strong. I also didn’t have buttermilk; I didn’t even have lemon or vinegar to make my own buttermilk. There is one more trick to making your own buttermilk though, which is adding 1 3/4 teaspoon cream of tartar to each 1 cup of whole milk. Okay, I don’t have whole milk either, just skim milk! But my substitution worked just fine. The cake was definitely moist and light, a real winner in my opinion! I’ll definitely use this cake recipe again, without a doubt. I was so impressed with this cake and so proud that it turned out so well! 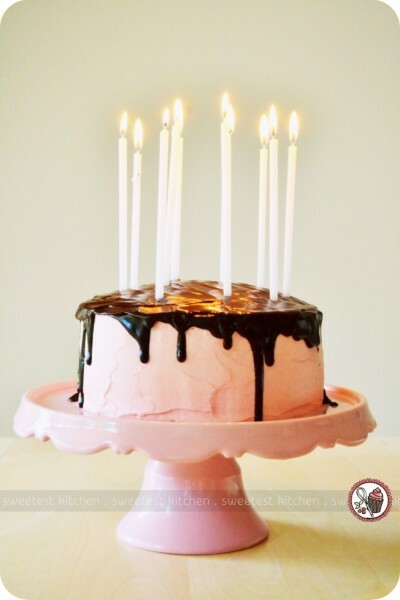 Coincidentally, my blog also recently had a birthday at the end of February – sweetestkitchen.com turned 2 years old! 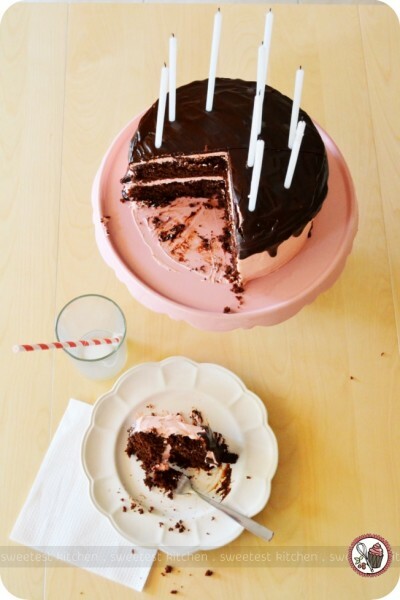 I considered my birthday cake to be a celebration of two birthdays! To everyone who has had a birthday this past week (and I know there are heaps of you), I hope you had a fantastic, fun-filled day with a cake as yummy as this one! 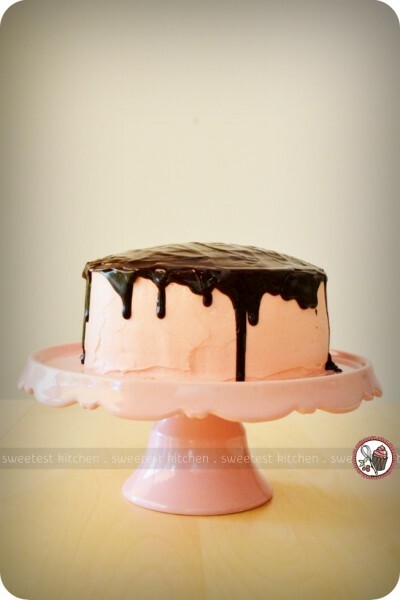 Dark chocolate cake and chocolate ganache glaze recipes via Sweetapolita. 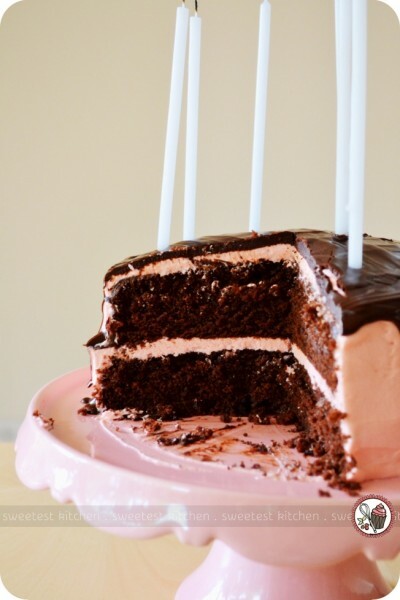 Buttercream frosting recipe (doubled for a 2-layer cake) via Western Star. Previous Post: « Giveaway: KitchenAid Artisan Hand Blender! Happy double birthday! 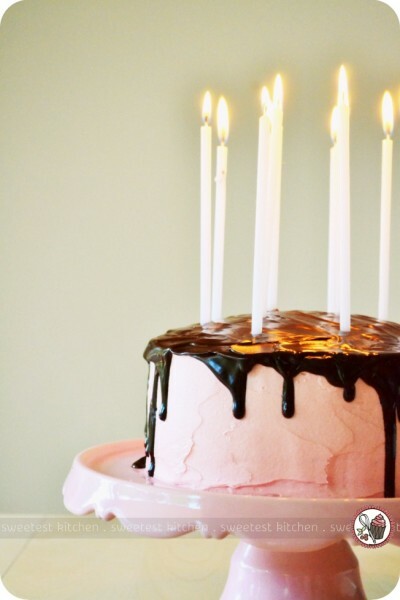 🙂 This cake is super cute – I LOVE the pink frosting and the tall candles … so much fun and so festive! Looks super delicious. This looks amazing! Just a heads up – your link to the recipe is a little off. 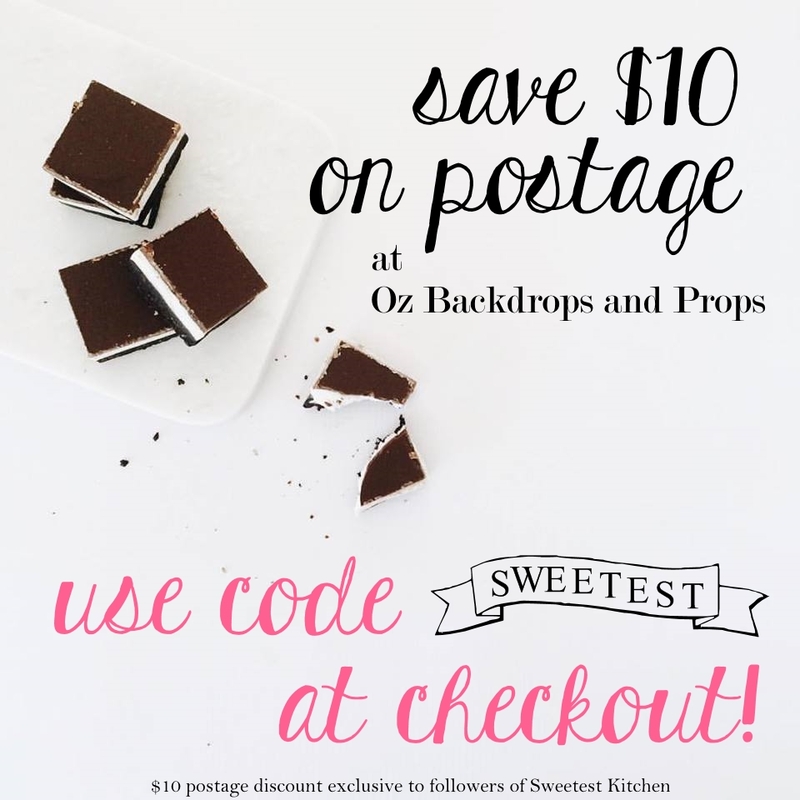 I found the correct page by deleting everything in the address before sweetapolita.com, but you might want to fix it so no one misses out on the deliciousness!! Thanks for the awesome post! Happy Birthday 🙂 Its my first time visiting your blog ~ But you’ve got some amazing recipes and this cake look fabulous! Thanks for sharing! Happy Birthday. The cake looks amazing! OMG. Stop! This is amazing! The recipe sounds delicious and the photography is stunning. What camera/lens do you use?